TMs King Felipe VI and Queen Letizia of Spain Preside Over an Award Ceremony. 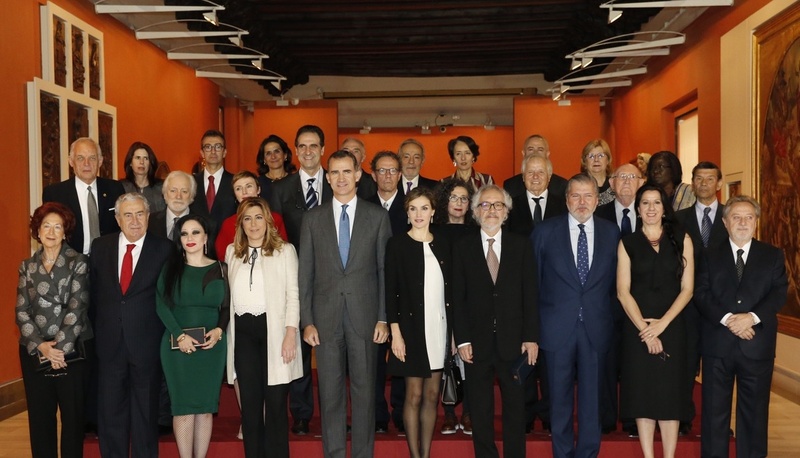 Their Majesties King Felipe VI and Queen Letizia of Spain arrived at the Museo de Bellas Artes de Sevilla in Sevilla on December 2 to preside over the Medallas de Oro al Mérito en las Bellas Artes 2014 (Gold Medals of Merit in Fine Arts 2014) award ceremony. The award, granted by the Council of Ministers on a proposal by the Minister of Education, Culture and Sports, distinguishes individuals and organizations who have excelled in the field of artistic and cultural creation or have rendered notable service in the promotion, development and dissemination of art and culture or the conservation of artistic heritage. Previous (VIDEO) HIH Prince Takahito of Mikasa Turns 100 Years Young! Next News Regarding HSH Prince Albert II of Monaco.